Beauitful 35 Acre property with an abundance of wildlife sitting atop a mountain. 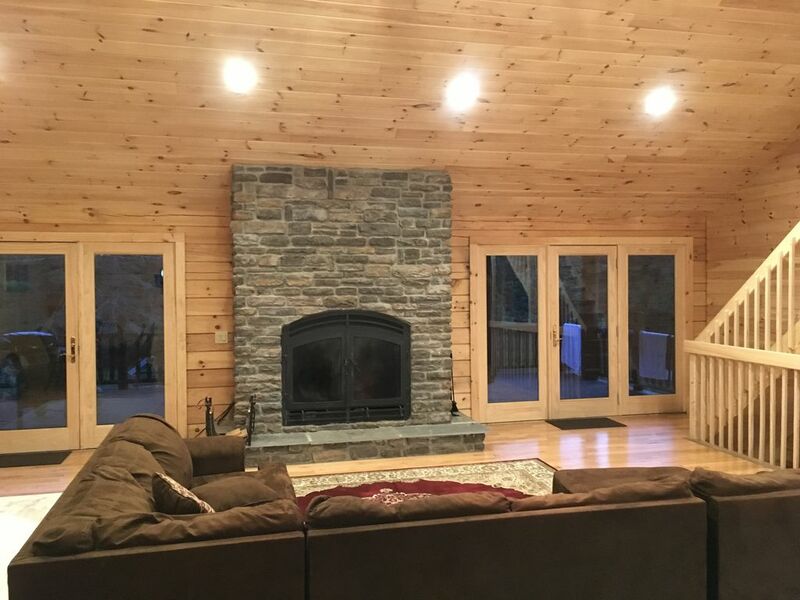 Property includes brand new (built in 2015) log cabin with 4 bedrooms, amazing "great room", large open area kitchen, 2 sided fireplace (faces inside and outside) and large back deck facing woods and large backyard. House is perfect for evening grilling and sitting around the campfire (fire pit in backyard). House has all the modern amenities from wireless internet, stainless steel appliances (large refrigerator with ice maker), microwave, walk in pantry, island in kitchen, gas grill on back porch, flat screen TV's in each room with DirecTV. Full washer / dryer in basement and modern HVAC system with central air conditioning and heating. No need to bring utensils or plates & glasses as house is fully stocked with everything you need (except the food). Master bathroom has shower and jacuzzi bath tub, guest bathroom has shower / tub and has towels, washcloths, soap, etc. Detached garage holds several mountain bikes as well as kids bikes (with and without training wheels). There is a beautiful covered car port in the front of the house such that you can avoid the elements (rain, snow) when you pull up the the U shaped driveway. Property has wide range of wildlife ranging from birds, foxes, squirrels, rabbits, turkey and many deer. Backyard is rouhgly 2 acres and full of grass. Visits here are the definition of tranquility, as you will hear no cars at night, watch the deer in the morning or evening and have comfortable nights sleep. Cabin is roughly 15 minutes from the closest town where you can stock up on food for your visit. Cabin is 90 minutes from NYC (without traffic) and easy to get to for a weekend getaway. We are a family of 5 with 3 young kids (all under the age of 8). We live in Manhattan and absolutely love coming out to our cabin in the country. It affords us a great space to relax, cook in the large chef’s kitchen and recharge before heading back to the city. We bought this property in 2013 so we could have a quiet weekend place surrounded by nature - away from the noise of NYC. This property and cabin truly allows us to recharge and provides us an opportunity to enjoy nature. Also, the cabin is modern and has all the niceties to ensure you truly have a comfortable, and importantly, clean stay. We do our best to ensure your experience feels like you are staying in your own place. Wildlife everywhere! We generally see several deer whenever we go the property, there are abundant hiking trails, and there is peace and quiet. Almost any time of year there is immense beauty here and provides a unique refuge away from city life (and its only 90 minutes from NYC!). Enjoy the 2 sided, natural wood burning fireplace (faces inside and also outside to back deck). Master Bathroom - connected to master bedroom. Has full shower and separate bathtub which is a large jacuzzi; master bathroom has 2 sinks side by side. No landline, some cell service. Dual (inside/outside) fireplace. Fireplace faces inside and outside on back deck. U shaped driveway that pulls up to carport such that you may pull up under covering during inclement weather. Detached garage that holds trash cans and lawn equipment. Not available for parking. Wifi available, however, when downloading videos, data can be eaten up quickly. If issues arise, text me to renew data. Living room or "Great Room" as it is referred to is large living area off of bedrooms. Includes large couch in front of fireplace. Incredibly comfortable for large groups of people to congregate. Pantry items are for owners. Grocery store and WalMart are within 15 minute drive and have very fresh meat and produce. Also, farmers market is roughly 15 minutes away as well. Large dining table perfect for large families. House has Wifi and DirecTV. Please note, our internet service provides 3mb per month. If you stream videos or watch movies, it will eat up the memory very quickly and internet will slow down greatly. Blue Tooth stereo available where you may hookup your IPhone. DVD player available in kids room. Some board games available in kids room. Kids room has kids toys which any kids are free to use. We have a small selection of DVDs. Large grass yard in back and side (approximately 2 acres). Rest of land is wooded and offers an abundance of wildlife. Great hiking in the area. Back deck has balcony facing backyard. 2 adult mountain bikes and 2 kids bikes (one with training wheels). There are two electric kids 4 wheelers (for kids approximately 4 years old and above). Large deck / patio facing large backyard and view of the woods and wildlife. Jacuzzi bath tub in master bedroom (not outdoor hot tub). We take great pride in maintaining a clean cabin and providing a nice experience for our guests. We see our cabin as an ideal retreat from city life and allows us to recharge and relax in a low stress and natural environment. This home is beautiful , I cant say enough good things the home is super clean the owners are accommodating.Open floor plan is great for entertaining! 2nd time and I am already looking forward to my return! The indoor /outdoor fireplace is amazing ! Thank you Wandy for such a nice review!!! Accomodations were clean, well maintained, and the kitchen was indeed well stocked. The common space is large and open which was perfect for our group to hang out in without feeling like we were on top of each other. Great time! Great place, we will certainly return. Thorough information provided prior to check in. One star less because we were unable to communicate with the owners over the VRBO app. Very spacious and comfortable. Loved the inside/outside fireplace. Kitchen was nicely equipped, and the property was beautiful. This is a beautiful property, will definitely will stay again. Very clean and well maintained. My family of 9 stayed at this property and had the best time. Not only is it very clean, but also well stocked with dishes, towels, and more then enough bedding for everyone. We really enjoyed sitting on the back balcony and hanging out enjoying the nature around us and the fire place. This place is steeped in nature, we saw tons of deers. Michelle was so sweet and accomadating. There is a super Walmart 15 min away. Walkill is 30 mins away, Patterson is an hour and 15 mins away and Warwick is an hour 15 mins away. There's a place called Fink's BBQ 10 mins from Warwick with amazing food. A definite must try. The Local congregation was 15 minutes away in Elenville they were so sweet, warm and inviting. Harvest in is 30 mins away where you can buy theocratic supplies. Overall if you love nature this is the place for you. My family and I were sad to leave because it was such a great house. We will be back. Thanks so much Michelle. Outstanding place,had no problems or issues, very clean and put together, would recommend this to anyone one looking for this type of vacation and plan on coming back once a year at least.Thank you so much. Hade a GREAT experience.